MainAll NewsDefense/Middle EastPM: "A Great Victory For Terror"
PM: "A Great Victory For Terror"
PM Netanyahu lambasted PA Chairman Mahmoud Abbas for embracing Hamas and giving terror a victory by signing the Fatah-Hamas Unity deal. Prime Minister Binyamin Netanyahu in London condemned the signing ceremony for the Fatah-Hamas reconciliation agreement in Cairo on Wednesday. "What happened today in Cairo is a tremendous blow to peace and a great victory for terrorism," Netanyahu told reporters. Netanyahu's criticism singled out Palestinian Authority Chairman Mahmoud Abbas, whom he referred to by using his popular terror-moniker “Abu Mazzen.” Abbas masterminded the Munich massacre of Israeli athletes in 1972. “What we hope will happen is that we find peace and the only way we can make peace is with our neighbors who want peace." “Those who want to eliminate us, those who practice terror are not partners for peace,” Netanyahu said. Israeli officials say Netanyahu will ask British prime minister David Cameron not to support the Fatah-Hamas reconciliation agreement unless Hamas agrees to accept the Quartet's principles for its inclusion in the PA. Those principles include a demand that Hamas recognize Israel, renounced terror and abide by past agreements with Israel. Hamas refused to do so and maintains it will continue to refuse. 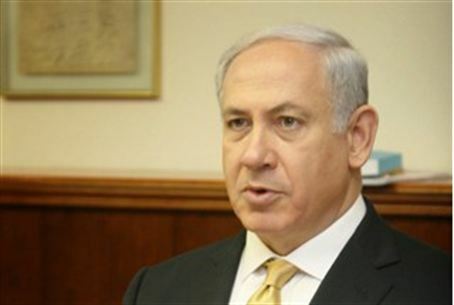 Netanyahu is expected to make the same request when he meets with French President Nicolas Sarkozy on Thursday.